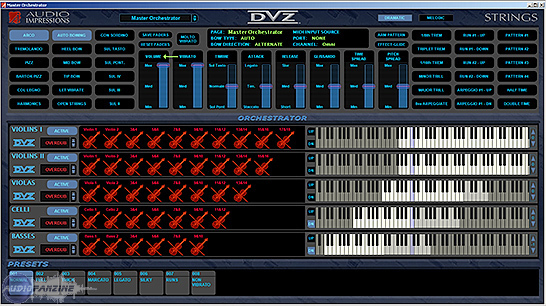 DVZ Strings 2.0, Virtual strings ensemble from Audio Impressions. Audio Impressions has announced the release of version 2.0 of DVZ Strings - their new high-resolution virtual-instrument strings library that comes with their patented Divisi technology which, AI states, eliminates the compromises of sampled libraries by delivering real-world, real-time, section balances. 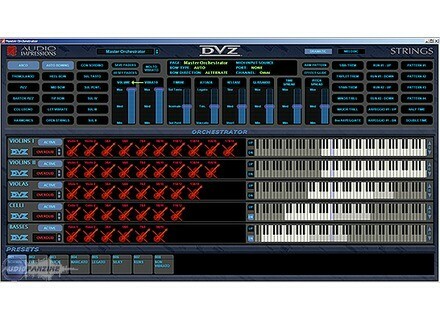 DVZ StringsDVZ Strings now use Ai's proprietary software that enables Mac OS X and Windows computers to work together and eliminates the need of additional D/A converters by routing the sampler's outputs into the host computer for improved lowest latency with less hardware. Also improved is the work-flow, DVZ stems can be viewed on separate MIDI tracks with real-time editing for as many as five sections at a time with independent articulations and playing styles, without ever having to load additional samples - the entire library is loaded at start-up. Individual stereo outputs for each string section with DVZ stems can be viewed on separate MIDI tracks with real-time editing for as many as five sections at a time. The strings are completely re-mastered and key switches have been added for changing styles on the fly via MIDI Continuous Controller messages that can be edited directly on your sequencer MIDI tracks. Included is SPACE a DSP process which transforms individually recorded instruments into a single live performance and a virtual sound-stage that lets you position the various players anywhere on it, and AudioPort, Audio Impressions' Mac OS X and Windows compatible high-quality digital audio over LAN solution. BIAS Peak Express 6 Berkley Integrated Audio Software (BIAS) has announced Peak Express 6, a major upgrade to the streamlined edition of its audio editor for Mac. Loopmasters House Improvements v 1 House Improvements v1 is the latest samplepack from Loopmasters which features the work of producer Justin Critchlow aka the Sound Diggers, who has produced a consummate collection of Deep, Chunky, Funked up and Glitched out House samples for dance producers. Chicken Systems Constructor Universal Instrument Builder Chicken Systems has announced the release of the Constructor Universal Instrument Builder program.